Dr. Beverly Wesner-Hoehn began her musical studies at the age of six. Beverly was active in the Sacramento Youth Symphony during high school and in college, she won a Rotary Fellowship to study at the Music Conservatory in Brussels, Belgium, where she received the Jean Risler Award for Outstanding Musicianship. 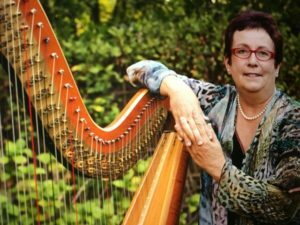 Beverly earned the Master of Music degree from University of Southern California; she then received the Doctor of Music degree in Harp, with High Distinction, from Indiana University. Later, she was appointed Assistant Professor of Harp at the School of Music in Bloomington where she taught harp ensembles and chamber music for many years. Currently Dr. Bev teaches at CSUS and has had an active performance career, highlights include: French National Radio, Harpweek in Holland, Rotary International, Dorothy Chandler Pavilion in Los Angeles, Indianapolis Children’s Choir under the direction of famed conductor Henry Leck, Walt Disney Epcot Previews, U.S. Senate Ambassadors’ Ball, Australia, Japan, England, Canada, Carnegie Hall Mid-America Productions, and a featured soloist for the World Harp Congress in Israel, Austria, France, and Denmark. Beverly also enjoys playing for a wide variety of ensembles: Sacramento Choral Society, Chanteuses, Master Singers Chorale, Camerata, Sacramento Theatre Company, Sierra Repertory Theatre, Modesto Symphony, Stockton and Auburn Symphonies, Schola Cantorum, Music in the Mountains, and the Northern California Children’s Chorus. Beverly has played regularly for Michael W. Smith, Gladys Knight & the Pips, Johnny Mathis, and young singing star, Jackie Evancho, along with more than 250 performances of the Nutcracker! She can often be heard (not seen) in the pit of the Broadway series at the Music Circus. Her favorite key is Db major. Beverly’s wide variety of CD’s, whether solo, chamber music with Trio Brio, harp & organ, harp and children’s chorus, or harp and handbells are available on iTunes, CD Baby, Amazon, and Spotify. Follow her latest concerts, recordings, and world travels at drbevharp.com.